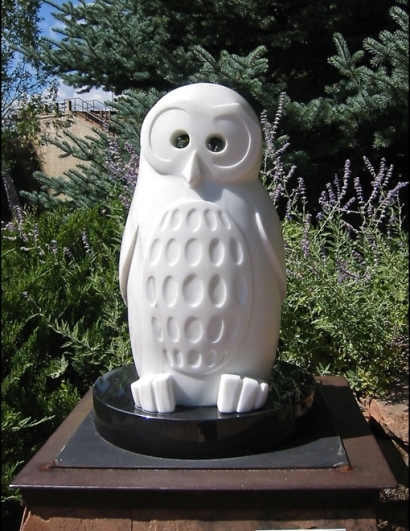 “See through Other Eyes: Spotted Owl” is the second stone sculpture in my endangered species series. The Northern Spotted Owl is the apex predator (top of the food chain) in old-growth forests. As the forests are being cut down, the habitat of the Spotted Owl is disappearing, and consequently, so are the Spotted Owls. This owl is the “canary in the coal mine” for old-growth forests. Its disappearance is an indication that the entire ecosystem is failing due to the over-cutting of trees. Saving the Spotted Owl means saving the old-growth forests. This sculpture is my first piece intended for outdoor display. This is exciting for me as I would like to make more outdoor sculptures. The stone is Colorado Yule Marble, and this particulatr piece of Yule has enormous snowflake crystal. Outdoors is a perfect place to display this sculpture as the crystal is absolutely dazzling in the sun, it looks exactly like the sparkles on fresh snow when the sun shines on it. “See through Other Eyes: Spotted Owl” is designed as an interactive peek-through experience. 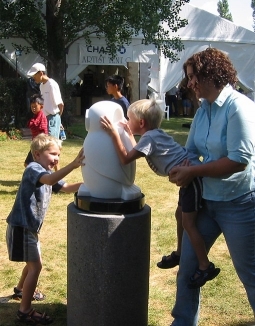 Visitors to the Loveland Sculpture in the Park show enjoy some happy interaction with the Owl. The eyes of the owl are drilled all the way through and invite the viewer to see the world from the perspective of another being. Share the earth and make sure there is room for all creatures to live.